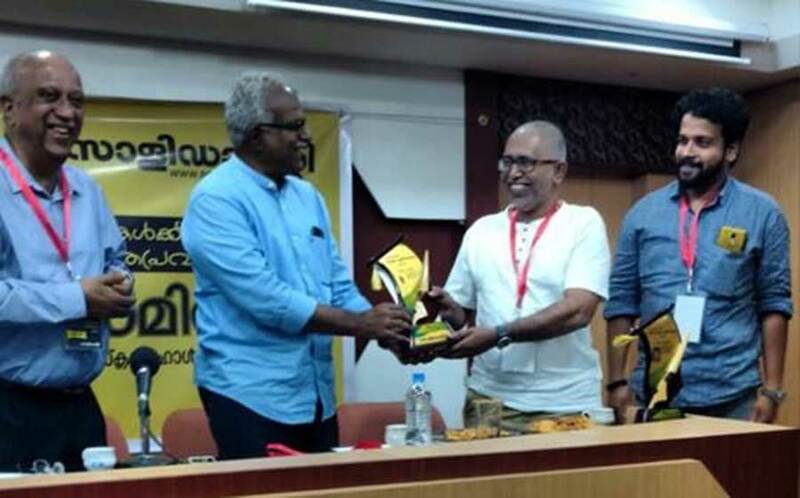 This award was bestowed upon Countercurrents.org and me for the courageous interventions in human rights and citizen’s rights. Let me make it very clear, I do not have any such claims. I’m doing whatever little I can in my limited capacity for humanity and other species on earth. Since the organizers have bestowed upon me such a heavy responsibility, let me share my insights about the past, present and future of human rights. The flood that Kerala witnessed recently made one thing clear. It’s not just the Western Ghats as professed by some environmentalists is an ecologically sensitive area, but all parts of Kerala are ecologically sensitive. If we extend this concept it would be clear to us that the whole world is an ecologically sensitive area, which means that we’ve nowhere to escape to in the face of a flood, drought or a hurricane! The paper called ‘Hot House Earth’ was published almost at the same time Kerala was under water. According to this paper, if we do not take urgent action to prevent global warming, mean temperature would rise to 5 degree Celsius and the sea level would rise to 10 to 60 feet from the mean level. On October 5 Intergovernmental Panel on Climate Change(IPCC) published a special report. According to this report we’ve just 12 years to prevent catastrophic warming. Unless we take actions by 2030, 1.5 degree Celsius warming would be a foregone conclusion. For the first time IPCC admitted that sea level rise by the end of the century would be at least one meter higher than the mean level. When Countercurrents.org was founded in 2002 the CO2 level in the atmosphere was 370 ppm. Now it’s around 410 ppm. According James Hansen, the father of Climate Change science, this is the CO2 level that prevailed in the Eemian period about 1,25000 years ago. Paleoclimate studies reveal that during that period sea level was 7 to 9 feet higher than it was today. This means that we are moving into unchartered territories in our climate. Global warming is not just a phenomenon that affects the sea coast, that many cities would be under water by the end of the century. The reality is that Climate Change would bring devastating floods, droughts, hurricanes, snow storms and such extreme weather events. If humans can not live in this planet, what’s the point of human rights? The second issue I’m raising is that of resource depletion. According to International Energy Agency’s World Energy Outlook report published in 2010, conventional oil (easily extractable oil) peaked in and around 2005. The shortage was met by the extraction of unconventional oil through fracking, tar sands extraction, deep sea wells etc. It would be interesting to note that in July 2008 oil reached a record peak price of $147.27/barrel. It would also be interesting to note that global financial crisis occurred during this period. You may ask, what’s the relation between the phenomenon called ‘Peak Oil’ and human rights? There’s only one answer. Energy is the underlying source of modern civilization. Fossil fuels are the cheapest source of energy that can be easily handled. It’s with this source of energy we built the modern civilization, with its infrastructure, hospitals, schools, universities, factories, technology…… It’s just not the fossil fuels, but almost all other minerals and metals have been extracted by human beings to the maximum and are peaking. 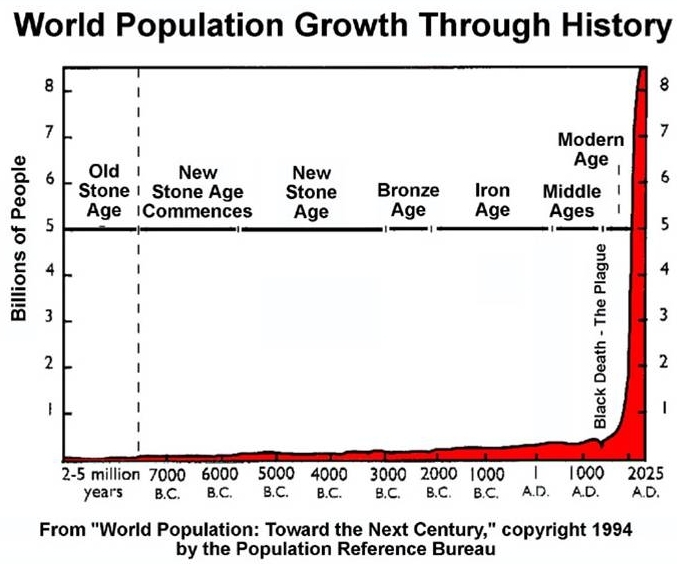 It’s also interesting to note that human population exploded when we had cheap energy. For instance when India attained freedom from the British in 1947 the population was around 300 million. Now 70 years later, the population stands at 1.3 billion! During most part of human civilization, population was steady, hovering just around one billion or below. Just after the industrial revolution, when humans started using fossil fuels, the population began to increase. With the discovery of crude oil and its wide usage, human population just exploded. When it’s gone, the population that grew with it too will be gone. The graph will be flattened. The trauma of that catastrophic event is beyond the comprehension of most of us. Billions will die. It’s not just numbers, but humans in flesh and blood! Relationships will be gone! We can’t handle even the death of a dear one. How about billions of deaths? It will also bring in political churnings. When humanity faces a crisis, authoritarian forces would emerge to take control. Fascism will raise its head once again. Chaos will prevail. In fact, it’s already happening. 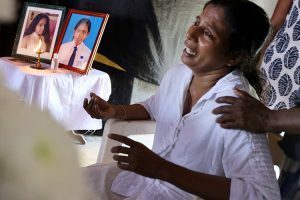 Whither human rights? Optimists may say there will be alternative energy or technological fix to prevent such chaos. Scientists have been searching for that magical energy source to replace the dirty fossil fuels. According to my knowledge, no headway has been made so far. I do not have any hope that such breakthrough would come soon enough. Even if a technological breakthrough is made, there is the catch that we’ve used up most of our resources to sustain our humungous population for another century or more. The 1972 Club of Rome report ‘Limits to Growth’ has confirmed that economy cannot grow forever. A 2014 update to this report also confirmed this reality. The capitalist economic system is based on the assumption that economies will grow forever. Today, except may be for Cuba, most of the nations of the world are imitating the capitalist model. It’s dangerous. Once economic growth comes to a standstill, as described above, whole system will collapse like a house of cards. Banks would fail. Industry would come to a grinding halt. Jobs would be a dream. Jared Diamond in his famous book ‘Collapse- How Societies Choose to Fail or Survive’ has analysed many collapsed civilization. His terrifying conclusion is that at the end of most societies humans resorted to cannibalism. He came to this conclusion by analyzing the faeces of the last survivors of the collapse. If we end up in cannibalism what’s the point of human rights? Yes, we are heading to a collapse. We’ve just 12 years left to save our home, our beautiful earth. Here are some practical suggestions to avoid a collapse there by protecting human rights and the rights of all other species on earth. The list of course is incomplete. You can add more. Discuss and debate and take action. That’s the only way for us to avoid a catastrophic collapse and save our mother earth and all its species. Thanks, editor, Countercurrents, for the useful speech. A very clear analysis of what lies ahead if humans neglect the rights of all other species on Planet Earth. Heed the warning before it is too late! It is a measure of your creativity, sensitivity and love for all living beings that you used the occasion of being conferred an award for upholding human rights to highlight the near and eventual extinction of life from planet earth. Your seven suggestions to avoid an imminent collapse should start a debate and open a channel for action – personal and political, both locally and globally. Humanity stands forewarned yet once again. Great speech. Much truth. My estimate for the number of deaths from starvation and conflict this century, that follow from the facts in your speech, is 8-10 billion people. I could be wrong. But to gain a perspective on the human predicament, everyone needs their own estimate for “who will get injured and when.” They need to know how an alternative behavior changes that estimate. I am not sure how your handle video contributions (instead of text) but I try and put my thoughts into a special form of video. Please consider these three for publication. All of us need to acknowledge that our continuation rests on one premise and one only: Planet earth and its surrounding biosphere is finite. Every form of life is interdependent within the finitude of the planet’s energy field. The butterfly on my butterfly bush, the insect crawling in my garden, the wasp on my porch, the spider in my window, the deer in the woods outside of my house, the bear there too, the Wildebeest on the Serengeti, the Tuna in the ocean, the life form in my gut; they all as I do exist within this finitude. And all “non-life” on our planet too. For our species’ survival, a new global moral/ethic that recognizes this reality is called for. It will require enormous human behavioral change; social, political, philosophical, religious and economic. Presuppositions we have believed to be “inherent truths” we are now discovering were built on geo-ecological flaws will have to be abandoned. Without such abandonment, we as a species are finished. Boss, you are not an ordinary person. This award is just a beginning. This world will be much more richer if it could produce more like you. Thank you very much, Binu, for this survey. As your reader since the early days, must say that this survey is in full synch with “left biocentrism”, or “ecocentrism” that we, The Ecocentric Alliance, have been propounding since the 1990s. And recently in an ecocentric journal “The Ecological Citizen” https://ecologicalcitizen.net/ . – In solidarity, Victor Postnikov. Great Binu ! Congrats 😤!! Thanks to Binu for this article and for Countercurrents too! !